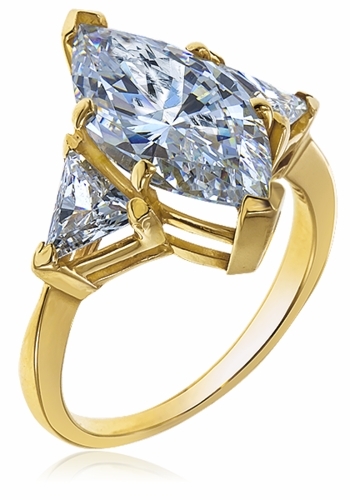 The 2 Carat Marquise with Trillions Cubic Zirconia Three Stone Ring features a 2 carat 12x6mm marquise shaped center stone that is flanked on each side by a .50 carat 5mm trillion or triangle shaped stone for a total carat weight of 3 carats. 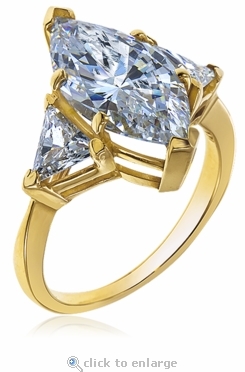 This ring is perfect to be worn as an engagement ring or wedding ring. Available in 14k yellow gold in whole and half finger sizes 5 through 8. This ring style is also available on the regular part of the site in other carat sizes and options, please see item R1010M. For further assistance, please contact us directly at 1-866-942-6663 or visit us via live chat and speak with a knowledgeable representative.